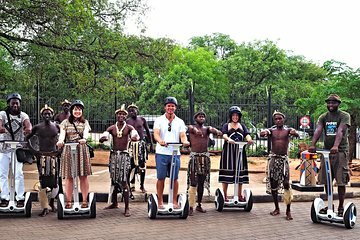 Explore one of the world’s iconic natural landmarks—without wearing yourself out—on this relaxing, scenic Segway ride through Victoria Falls. Cover more sights in less time on your own set of wheels, including Zimbabwe’s oldest luxury hotel and an enormous, centuries-old Baobab tree. Small-group tours also include a complimentary beverage in a cafe overlooking stunning Batoka Gorge. customer to advise Tamuka Travel their hotel so that we can arrange transport 30 min to an hour prior to activity commencement from your listed hotel within victoria falls town. Any hotel outside victoria falls town will attract an extra $10 per person. The Segway has a weight carrying restriction of up to 117kg or 260lbs (including the rider and all cargo). Children must be accompanied by an adult and weigh no less than 45kg or 100lbs. Please advise of any specific dietary requirements at the time of booking. Subject to favourable weather conditions. If cancelled due to poor weather, you will be given the option of an alternative date or a full refund.